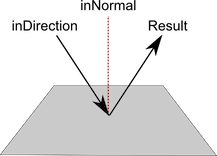 The inNormal vector defines a plane (a plane's normal is the vector that is perpendicular to its surface). the inDirection vector is treated as a directional arrow coming in to the plane. The returned value is a vector of equal magnitude to inDirection but with its direction reflected. Reflection of a vector off a plane.